The first time that I tried the Butterbear Bath Bomb was back in the winter of 2014. I will admit that I wasn’t completely blown away by it, I would however like to point out that this is not because I disliked it, the other more colourful bath bombs just seemed to prevail it, leaving it in the shadows and at the bottom of my draw. Butterbear although a bit dull performance wise is a very gentle bath bomb that both adults and children can enjoy. Ever since 2014 I have bought each of the children in my family a Butterbear bath bomb as they adore bath time and they always get so, so excited about bath bombs. I have never forgotten what it was like to be a little girl and by complete accident I started a Christmastime Butterbear tradition in my family. 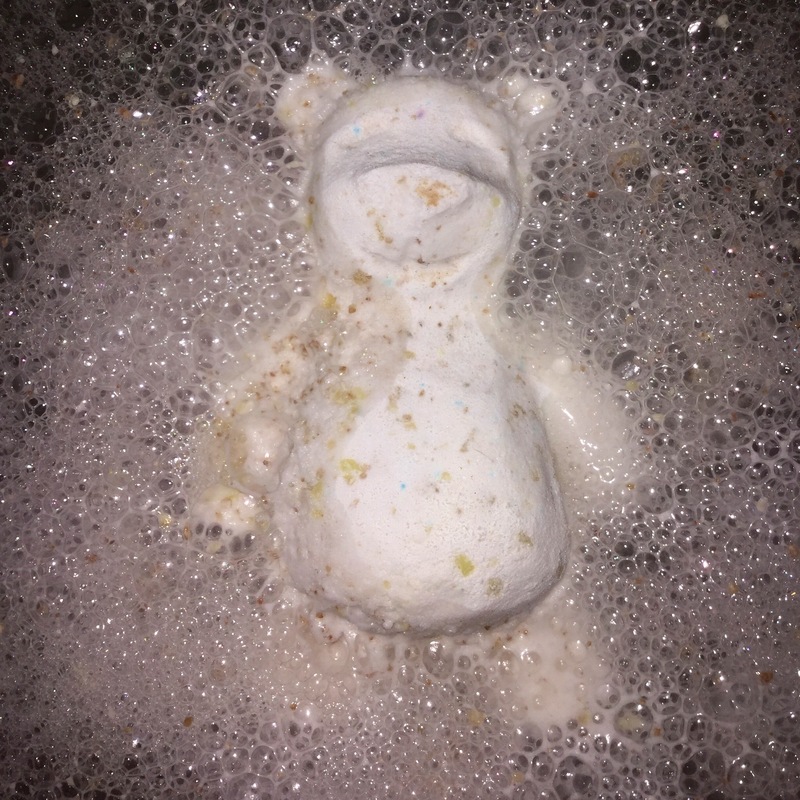 When I very first gave the Butterbear bath bombs to the kids I tried to make them a little bit more interesting. I told them to make a wish before they put them into the bath, the idea behind this was so that they wouldn’t be sad that she/he had gone after just one bath. I told them that the Butterbear’s job was to listen to their wish, followed by them then fizzing away in the bath, preparing themselves for their journey to the North Pole which of course is via the plug hole. Once down the plug hole the Butterbear’s job was to then find Father Christmas to let him know their Christmas wish. That is how one silly, made up story turned into a Christmastime tradition for my family. I felt I had to explain this as it is this that helped make the Butterbear bath bomb a special product for both myself and them. Sometimes the smallest amount of imagination can make something that appears dull a lot more interesting! The Butterbear bath bomb is relatively small, the closest bath bomb to its size that is currently available is the Ickle Baby Bot bath bomb. Based on its size I’d describe the Butterbear bath bomb as more of a novelty product. It smells exactly the same as the Butterball bath bomb it however isn’t as strong. Pushing its smaller size to one side, I still find the Butterbear bath bomb to be very moisturising on my skin. I do however feel like I get more out of it when I pair it up with other products. My favourite cocktail at the moment is the Butterbear bath bomb with a splash of Bubbly shower gel, I am desperately in search of Butterball shower gel to pair with it, fingers crossed I get some soon. As soon as it is placed in to the water the Butterbear bath bomb fizzes away very quickly. There’s a lot of white foam and then once the bear has dissolved you notice that there are tiny beads of oil floating on the waters’ surface. These beads are the cocoa butter and although there isn’t a lot of it, my skin well and truly benefits from it. It isn’t quite as hydrating as the Butterball bath bomb is but its sweet scent stays with me through out the bath leaving me wanting more. As I said above, I feel that the Butterbear bath bomb is best when paired with other products. What wins it over for me is its soft and creamy scent, the story that goes with it in my family is an added bonus that makes it a very welcome product, every winter. I can’t ever imagine them discontinuing it, the little people in my family would not be very impressed! So cute how Butterbear has turned into a tradition for your family! How cute is that story! I’m going to grab a butterbear and make wishes too. Good idea, hes a cutie!